I usually start my Christmas shopping in about August as I have so many people to buy for I've got no choice but to start early. My Christmas shopping is usually all online with a couple of family Christmas shopping trips in store too. I don't do the cooking on Christmas day so nope. Sorry not sorry. Me and my two little brothers get up early, but not too early as my mum and dad don't let us down before 7am! How mean is that? :o So we usually gather on the landing waiting for my dad to say that its ok to come down, then we go into our living room to see what Santa has brought us all this year. Then as the morning goes on my other 3 sisters and brother come to visit with their partners and my nieces and nephew. Christmas morning breakfast is usually sweeties and chocolate hehe. Then we take it in turns every year between my mum and my aunt for Christmas dinner. This usually involves plenty of family games, alcohol, an amazing dinner, playing with the kids and lots of naughty treats. Come tea time we are all ready for a nap so we come home or go into the living room if we are celebrating at home and then we all sit down and watch our favourite Christmas films. I'm looking forward to watching Deathly Hallows part 2 this year. Nothing out the ordinary really. All the family and their partners usually pile at my mums house on Christmas day. We don't do a certain thing every single year, but I do remember having to go to bed really early on Christmas Eve when I were younger. Then my mum, dad and older siblings would have a take away and a few too many drinks and then get in bed at about midnight. Me and my younger siblings were always awake as we couldn't sleep due to excitement. Definitely the Nescafe Dolce Gusto - Latte Macchiato. We get the Coffee machine out when the colder seasons creep up on us. I have a Christmas playlist on my phone :o My favourites would have to be Santa Baby, Driving home for Christmas and All I Want For Christmas Is You. Watch lots of Christmas films with my family and get the kids really excited for Christmas in the morning. The main Christmas tree is 6ft tall and has the prettiest decorations on it. I'll just add a picture so you can see for yourselves. 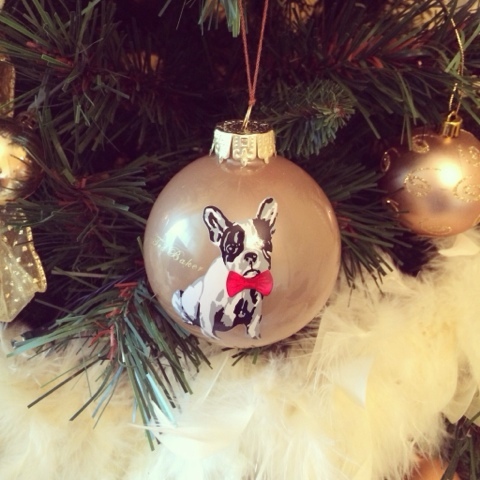 We got the Ted Baker - French Bulldog bauble in memory of my little Frenchie that we lost not long ago, so she can still be with us at Christmas. 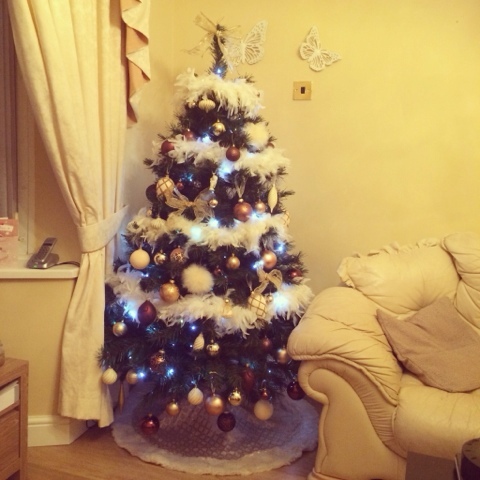 We decorate our tree in the living room, we also have one in the extension (dog room) and then me, my brother and youngest brother all have one in our bedrooms too. We also put tinsel on the bannister and other random places in the house too, I've always wanted to make a Christmas display, that may be on the cards for next year. I don't tend to go to Christmas parties that much, but if I do I usually just wear a dress and heels. Nothing sparkly or anything as I'm not really a lover of sequins. Christmas day = Christmas jumpers for us all! I can't wait to see the picture of us all this year as we've all gone OTT. & A H a p p y N e w Y e a r ! This is such a lovely tag ! This is a great tag may have to give it ago myself! Cello tape dispenser is a MUST haha such a time saver. Aww this has made me feel all Christmasy :) you have such a pretty tree.